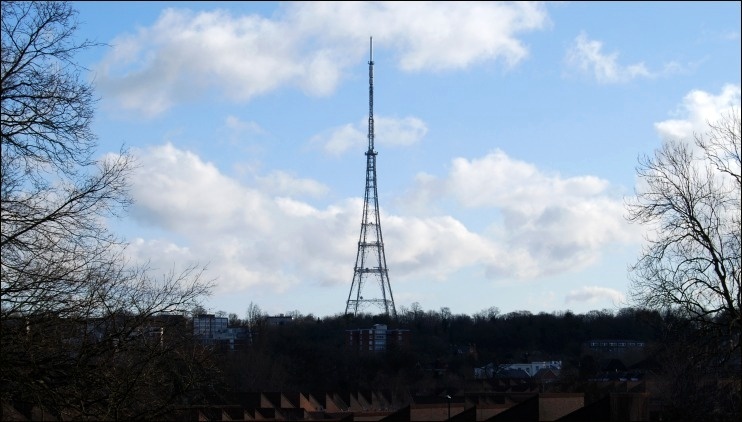 THE CRYSTAL PALACE TRANSMITTER is the UHF main station that serves Greater London and the Home Counties. In terms of coverage, it is easily the most important transmitting station in the country, with nearly 12 million people receiving its output. 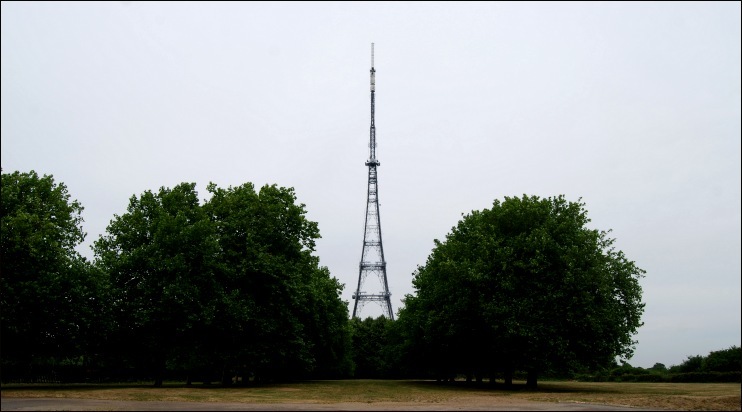 It is sited in a high profile position towards the north-east corner of Crystal Palace Park and is distinguished by its unique self-supporting lattice tower. 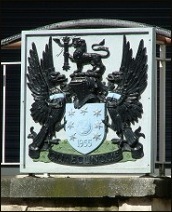 The station broadcasts to an approximate 40-miles radius spanning the whole of Greater London and much of the surrounding counties, including large parts of Surrey, North Kent, South & East Essex, Hertfordshire, Buckinghamshire and Berkshire, with fringe reception also possible in some areas of Oxfordshire and Sussex. The Crystal Palace tower is unique for being the tallest free-standing lattice transmitting structure in the United Kingdom, standing at a total (main UHF aerial-inclusive) height of 219 metres (718-ft). The adjacent Croydon transmitting station is the site of the second-highest self-supporting lattice transmitting tower in the UK, the main structure standing at a height of 152.6 metres (500-ft). In preparation for the switchover, replacement of the main UHF aerial at the top of the Crystal Palace tower commenced in June 2010. Removal of the old aerial system and surrounding fibre-glass panels, plus installation of the new aerial system were carried out manually (i.e without helicopter assistance) with the fitting of the new panels observed as complete by 20 July 2010. Fulfilling the engineering requirements for this site has produced an aerial system design which is seemingly unique in being based on curved multiple-panel sections (as opposed to four straight sides) which has enabled the retention of the tubular characteristic of the old analogue GRP cylinder-type installation. Images of the work-in-progress, starting from the point where the old UHF aerial system had already been removed, can be found on the DSO - New Main Aerial page. The switchover at Crystal Palace took place on 4 April 2012 for Stage 1 (DSO1) and 18 April 2012 for Stage 2 (DSO2). Stage 1 saw the usual closure of both analogue BBC2 (UHF Channel 33) and the original BBC Multiplex 1 (Channel 25) to enable their replacement with the new PSB1 (BBC A) Multiplex. With UHF Channel 33 being one of frequencies due to be sold-off, this was another example where the straight reallocation of the ex-BBC2 analogue channel to PSB1 (BBC A) could not take place. In this instance, ITV1 analogue moved for the remaining 14 days of operation from Channel 23 to Channel 33 to allow the release of the former to PSB1. Stage 2 of switchover proceeded at just after midnight on 18 April 2012. The first service to cease transmission entirely was BBC1 at 12.10am with an announcement over the end credits of the final programme (The Estate) that the BBC Director-General Mark Thompson was standing-by at Crystal Palace to perform the switch-off, which proceeded as soon as the programme credits finished. ITV1 shut down without any announcement at the end of their programme at 12.30am. Channel 4 broadcasted their Test Card with a message over it announcing the closure of the service before the signal was switched off altogether. The launch of the remaining PSB Multiplexes and the three COM multiplexes, replacing the closed analogue services and the remainder of the pre-switchover digital multiplexes, proceeded on schedule. 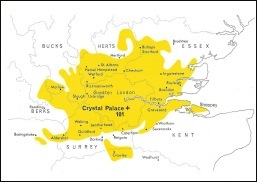 Having transmitted at the maximum power applicable to analogue television transmission in the UK (1000kW e.r.p), Crystal Palace now transmits at the maximum power applicable to digital transmission (200kW e.r.p). As with analogue, this places the station within an elite group of just three main UHF transmitters broadcasting at the maximum power, with Sutton Coldfield remaining as the second station, whilst the third has changed as a result of switchover process from Sandy Heath to Rowridge. The switchover at Crystal Palace was celebrated over the nights of 18/19 April with The Arqiva Crystal Palace Light Show. Crystal Palace was first opened by the BBC on 28 March 1956 as replacement for their original London television transmitter at Alexandra Palace in North London, which had broadcast the world's first regular television service in 1936. Fundamentally, the Crystal Palace station with its much taller tower offered increased aerial height for significantly improved coverage. This was achieved from the opening of the station, even though at this stage the tower was only half built (with aerials hung at the highest point available) and would not be completed until December 1957. The use of a self-supporting tower instead of the usual stayed-mast was in itself a condition of planning permission for aesthetic reasons, whilst also necessary anyway in order to comply with the requirement that the station was to be confined to a small area of Crystal Palace Park, in order to minimise its visual presence and impact on public amenity. For housing the transmission equipment, the BBC constructed a single block facility, built against the north-east wall of the park and capable of housing all site operations plus room for future expansion. The site entrance was placed on the eastern end of the compound and connected to street level by an ascending driveway. The tower was grounded above the station building at street level, from which side the latter was invisible and therefore classed as semi-underground. For the purpose of 405-line transmission on VHF Band I, the station would be the first to utilise a high gain aerial system to achieve the eventual Effective Radiated Power (ERP) of 200 kilowatts. Using this principle, the aerial would multiply the actual transmitter power several-fold to achieve the desired ERP whereas earlier stations typically operated at an ERP of no more than double the actual transmitter power. As well as permanent aerials for VHF Band I transmission (on Channel 1), the completed tower was also fitted with experimental Band IV and V aerials for UHF test transmissions which commenced in 1958, whilst space was also reserved for ITV Band III aerials, even though the Independent Television Authority (ITA) established their own transmitter (Croydon) in 1955, located just over a mile away on South Norwood Hill.